While perusing decorating blogs (my other obsession), I came across a color palette that I really liked. The room used khaki and a purple-leaning taupe, coupled with bright and dark berry pieces. It had a wintery feel to it which is appropriate since it's been frosty here in the midwest the last few days. Of course, we polish addicts equate color to polishes. 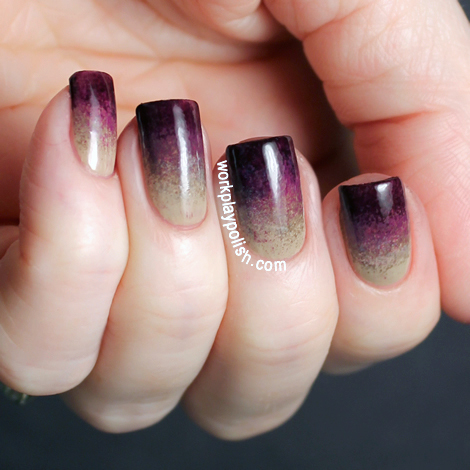 And so, this gradient mani was born; composed of Essie Jazz (khaki), OPI You Don't Know Jacques (taupe), Barry M Bright Purple (bright berry) and Sally Hansen Salon Manicure Pat on the Black (dark berry). I used a modified sponge technique. Instead of painting all four colors onto the sponge at once, I sponged each separately. I started with two coats of Jazz, then sponged You Don't Know Jacques about 3/4 the way down, Bright Purple about 1/2 the way down and Pat on the Black at the tips. I really like the end result. 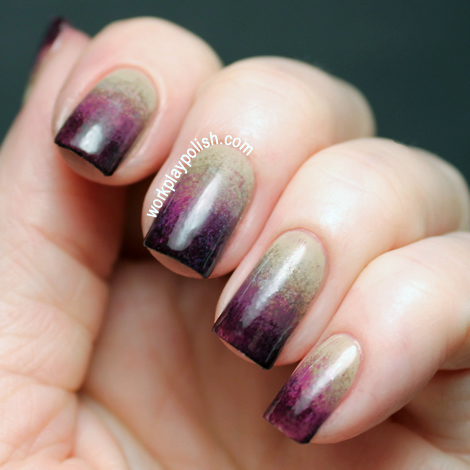 And because there are only 2 DAYS LEFT to enter my ZOYA GILTY PLEASURES TRIO GIVEAWAY, I finished off the mani with a coat of Zoya Gilty. I just love this gold flake topcoat. It's an easy way to take your mani up a notch. Zoya is actually restocking the trio but has increased the price to $35. So maybe you can win one here and get it for FREE! 10 ways to enter! Good luck!